Update 2017: The FCC & Somos (national database of toll free numbers) recognizes the toll free 866 prefix as an official toll free number. Small businesses can secure 866 toll free numbers and use them the same way a traditional 800 number works. Toll free 866 numbers fist became popular when the TV show American Idol used 866 numbers for their call in and vote hotlines. 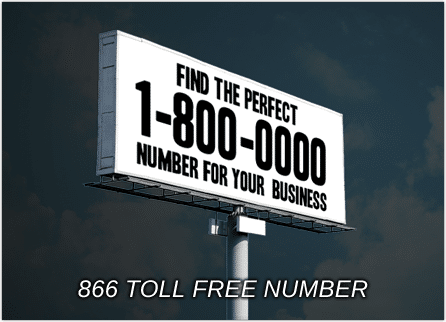 Since their use on American Idol toll free 866 numbers have become the second most popular toll free number prefix used by small businesses today. Why use 866 Toll Free Numbers? 866 toll free numbers are portable, therefore you maintain ownership and the ability to transfer them from carrier to carrier. Toll free 866 numbers are newer than their 800 number predecessors so you may have a higher chance of finding available custom vanity 866 numbers. 866 numbers are less likely to have been used or recycled by a different business, so you’re less likely to have people calling your number mistakenly, however an even newer prefix option would be to get an 855 Toll Free Number. 1. What are 866 Toll Free Numbers? An 866 toll free phone number is an official prefix released by the SMS National Database. It functions the same way other toll free numbers work. 2. Are toll free 866 numbers different than 800 numbers? Only in that their area code is 866, otherwise no. 866 numbers were simply released in the 1990s because there weren’t enough toll free numbers to meet demand. Since then, 888, 877, 855, 844 and 833 numbers have all been released. If you’re looking for an 866 vanity number you might have a better shot finding the number you want with a new toll free prefix like 844 or 833. 3. Why should I get an 866 Toll Free Number for my small business? 866 toll free numbers give your business instant credibility, as they are widely recognized as business phone numbers. However, the most important reason your small business should get an 866 toll free number is portability and ownership. The FFC provides businesses with the ability to own their toll free number and move it from one service provider to another. Your phone number keeps you connected to your customers, so you want complete control of over it.